Kevin Wong thinks the first time he fantasized about the Olympics was when he was 4. His parents told him he was mesmerized watching the pageantry of the opening ceremonies on television. "It was the colors and flags and everything," Wong said. The dream began in Wong's sandbox days, but the tyke never imagined that playing in sand would get him into the Olympics. The fact is, Wong, a 27-year-old Punahou graduate, and his partner, Rob Heidger, are on the verge of clinching their beach volleyball berth in Sydney. Holding a substantial lead on all other U.S. teams, it would take a major collapse for Wong and Heidger not to qualify when the U.S. team is made official in August. Wong and Heidger are poised to make a medal run when they get Down Under. But Wong had little reason to believe he'd ever make it into the Olympics when he was a prep athlete. Olympic dream quote: "At first it was for the money. Then it was not about money. Just about fulfilling a kid's dreams." He started Punahou as a basketball player, a sport he played until he made all-state as a senior. But while he was an underclassman, he realized that basketball was not the ticket to a college scholarship, so he also started playing volleyball. He didn't get a chance to start until his senior season, and when he got to UCLA, he had to walk on. It took three seasons before he received scholarship money. When he did get to play regularly, it was in a supportive role. "I was kind of a late bloomer," said Wong. Even before Wong finished up with the Bruins he decided that sand, not wood, held his athletic future. He enjoyed it and he knew he could make money at it on the professional volleyball tour. 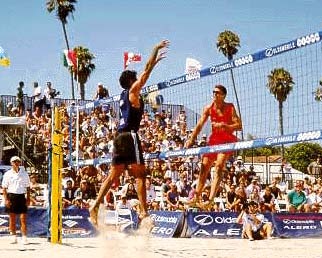 "At first it was for the money," said Wong, who saw beach volleyball become an Olympic sport in 1996. Kevin Wong, left, dreamed of playing in the Olympics as a kid. "Then it was not about money. Just about fulfilling a kid's dreams." There's a lot to like about beach volleyball, according to Wong. "It's easy on the joints," said the 6-foot-7, 220-pound player. "It's so much better than being in the gym. And there's travel." He gets to play beach volleyball in places he never expected. Places like Moscow and Berlin. "They truck in sand," he said. "We played in a parking lot near where the old Berlin Wall was." It's a Gypsy lifestyle but it agrees with him. Among the "craziest places" he's played was the United Arab Emirates last year. "Some oil sheiks with all kinds of money sponsored us for a weekend," he said. "They pulled up in their Rolls- Royces and they rolled out the red carpets for themselves, and they hired people to cheer. My partner and I won the tournament but we got none of the praise. Whoever our sheik was got all the praise." A few weeks ago, Wong and Heidger experienced what beach volleyball must feel like in hell. "They don't have beaches there so we played in a nice big arena by the harbor," Wong said. "But it was 120 degrees on the court and 95 percent humidity. It was unbelievable. "You change every time you have a break, and pour a bottle of water over yourself." He won't have a heat problem in Sydney, which will be emerging from its winter when the Games begn.